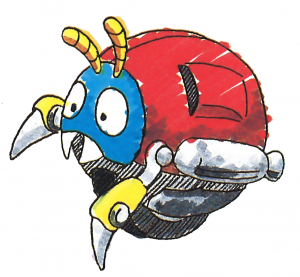 Motobug, a badnik from from the original Sonic the Hedgehog. Badnik is a term used to designate an enemy robot in the early North American and European versions of Sonic the Hedgehog video games. Badniks are presented as the minions of Dr. Robotnik, and serve as obstacles to Sonic and friends during their adventures. The concept of badniks has only ever existed in the Western Sonic lore, and following the release of Sonic Adventure in 1998/1999, the term fell into disuse, becoming more of a colloquial term used by those who were familiar with earlier original games and related media. In Japan, all badniks are treated simply as "enemies" or "Eggman's robots". Traditionally badniks take the form of small robots that can be dispatched by Sonic in one hit. Most were designed as robotic versions of animals, inhabiting stages where that animal is often associated (e.g. fish badniks are usually found in underwater levels). Most are powered by "organic batteries" - small animals which have been trapped inside, and are freed when the badnik is destroyed. Exceptions do occur, with the Doctor occasionally using plant seeds, rings, or other sources rather than creatures. Robotnik is typically portrayed as having produced hundreds of badniks to assist in his evil schemes, terrorising the residents of the Planet Mobius. Eggman's more modern robots (from Sonic Heroes through to Sonic Unleashed) are not generally described as badniks, as they lack the distinctive properties of the Doctor's earlier machines - no animal prisoner and rarely animal or insect-themed by design. Robots like the E-Series, Egg Pawn, and Egg Gunner have a more uniform, humanoid design and actually home in to fight with Sonic by using lances and shields, cannons, or just attacking him with their fists. Eggman would never use the term "badniks" to describe his robots again until Sonic Lost World. In the UK (Edgmont Fleetway) Sonic the Comic, all early Badniks were powered by Organic Batteries, the name given to the helpless Mobian trapped inside; however, stronger self-sufficient badniks known as Prime Badniks which could operate without the need of such batteries soon appeared. The first such was the Arachbot: a spider-like badnik that captured Tails in an early episode and that was resistant to Sonic's attacks until he torched it using the weapon from another badnik he had destroyed. Most badniks continued to use organic batteries, with the exception of Troopers and some special project badniks such as the Metallixs. In earlier episodes, Dr. Robotnik used mobile factories, which were basically large badniks that injested a Mobian, turned it into a robot, and then released it as a badnik; in later episodes, Robotnik used huge processing plants to churn out badniks in large numbers. The most powerful badnik type was the Cybernik, of which only 2 were ever made: Shortfuse and Vermin. Shortfuse was the first, a prototype made of Megatal, an ultra-hard metal, designed by Grimer to destroy Sonic the Hedgehog. However, its organic battery, Shorty the squirrel, took control and joined the fight against Robotnik, unable to escape from his metal shell. Vermin was sent to destroy him but was eventually destroyed by Shortfuse. All the Badniks on Mobius were immobilised in episode 100 along with all the electrical systems on Mobius, including Robotnik's Organic Computer on the Floating Island (but not the Floating Island itself or its ancient Guardian Robots), when Super Sonic burst out of the Black Asteroid in Mobius' orbit, transported from the Special Zone by the Omni Viewer, causing an Electro-magnetic pulse that covered the planet. Robotnik created a new batch from his new base on Flickies' Island but never regained control over the planet again. A one off-Sonic story considered a bit of a fan favourite was that of "Smokey and the Badnik", in which a Roller badnik (which features in Sonic 1's Spring Yard Zone) befriends a young Mobian called Smokey and protects him from a Trooper attack. Sonic spares the robot once he realizes that it is harmless and the two walk off into the sunset. This page was last edited on 6 April 2018, at 18:33.